Auto Ads are a new feature from AdSense which places ads on your site automatically. No need to create ad units or put them manually on your site. Sounds simple enough, but how about the revenue? We have been a beta tester of this feature and can report what is awaiting you with the official release on February 20th, 2018. Showing AdSense ads automatically on your website – that sounds like QuickStart, right? That particular option was only available to new AdSense accounts without manual ads set up. It wasn’t introduced well and many publishers reached out to our plugin support asking why our Advanced Ads plugin injects ads on their site. It turned out that all of them had the Page-Level Ads code enabled, which is also used to verify new sites and to deliver QuickStart ads. We found a way of informing those users about the automatic ads and since this article became one of our top tutorials a lot of publishers only learned about QuickStart through us. Auto Ads are replacing QuickStart and Page-Level ads and are in fact, only changing how they are managed in your AdSense account. The only significant change at this point is that you can enable Auto ads on a per-site level and you can group sites using the same settings. There are no further settings. Placements, sites, and styles of the ads will be chosen by AdSense automatically. Global and site-specific options are only different regarding the sites included. We are using the Global settings here. The Auto Ads code is the same code you would insert into your site to verify your AdSense account or to enable Page-Level ads. There is a chance that you already have or had it on your site. Using WordPress, you could just go to the header.php file of your theme and insert the code there. If you might change or update your theme later or don‘t feel comfortable coding, you could use our Advanced Ads plugin. Even the free basic version comes with a feature that places the Page-Level Ads code automatically on your site. Just go to Advanced Ads > Settings > AdSense and enable the Page-Level Ads option. No further coding needed. You can find more information in the WordPress Auto Ads tutorial. When you are already using AMP, you might ask yourself if you can enable Auto Ads there as well. While AdSense supports something called AMP Auto Ads, it is technically not related to the Auto Ads feature discussed in this article. AMP Auto Ads are also in beta right now, and we will cover them in another article. You can already read up on them here. We tested Auto Ads on two different websites. One was a standard blog, the other a dictionary-like site with a lot of automatically generated content. The performance of the blog increased a bit while the number of ads displayed by Auto Ads went down to 2 ads compared to 3 ad units on the manual setup. On the other website, no ads showed up at first while manually placed ads showed up correctly. After a few days though, one automatically placed ad showed up in the footer or header of the site. There is no dedicated report for Auto Ads. The Ad Placements report type now shows the performance of Auto Ads per site in it. You can also find the ad types you enabled in the Ad behavior report type. This report allows you to analyze the performance of the types like Vignette ads or In-article. This might not be enough since it wouldn’t allow split-testing if you use the same ad types in your manual setup. To be fair, this is only a limitation if you want to split test AdSense Auto Ads and manually placed ads in the same period, which might be a bit complicated to set up. I definitely don’t recommend running manually placed ads and Auto Ads at the same time. Should I enable Auto Ads? As far as I can see, Auto Ads could be an improvement if you are not comfortable doing setups and tests on your own. If you have a website with a conservative blog structure then testing Auto Ads for a few days might be worth it. So far, I cannot recommend it for advanced layouts and site types. I would also not recommend using Auto Ads if you have other ads on your site. There is no option to set the maximum number of automatically injected ads and no way of controlling where the ads are injected. I haven’t seen layout issues so far, but it could still happen that AdSense places its ads close to other attention-grabbing elements. Imagine you want to lead your visitors to a custom action, like a newsletter subscribe form or contact button. If you display bright ads close to these elements, users might only interact with one of them. Update: I received feedback from the AdSense team about the compatibility with manually placed ads. 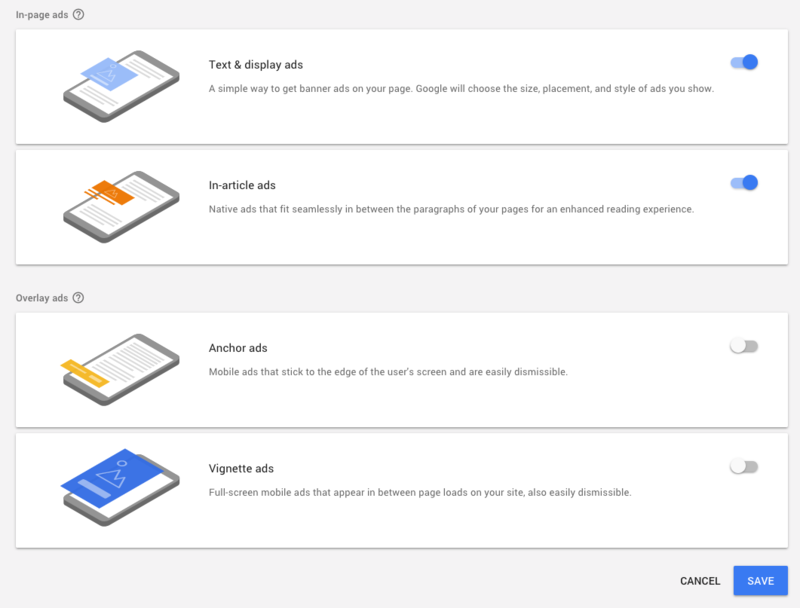 They can detect manually placed AdSense and DFP ads and don‘t display Auto Ads automatically next to them. They recommend to keep a manual setup if you have one and enable Auto Ads anyway to fill in spots that don’t have ads, like in very long articles. AdSense Auto Ads are a pretty new feature, and I would like to read your feedback if you have tested them already. Let me know which kind of sites you used it on and whether it helped you to increase your revenue or not. On my website, auto ads are not shown in the header section, can I use a manual ad with auto ads to fill my header section. Moreover, some of the in-article ads are not available showing up blank space on my website. Can you suggest me a solution for that? You, you can combine Auto Ads and manual ads. I would personally try to prevent this, but it is possible and not against any AdSense terms I know of. There are a couple of reasons why an ad stays blank. If the AdSense account is valid and displays other ads then this might be a new ad, which might take a few hours to show up. In adsense Auto Ads (in-article) mode, should my list of article constucted in ul li html format or can it be anything else like div etc? Hi tsains, Auto Ads are self-learning and it is too early for me to give suggestions of how, technically, a site should be structured in order for Auto Ads to work. I believe that simple blog formats are good and AdSense will continue optimizing other page types, too. After setting up auto adsense is there a tool to test that it is all good? That one has all the settings as they should be and the ads should start showing? If you don‘t want ads on random positions then this could be considered a negative effect 🙂 Otherwise, I am not aware of one. If in my website I didn’t enabled auto ads. Some days ago the ads I placed manually was working fine. But, now the text/image ads are not working perfectly. I’m using 5 text/image code in a content. But, it shows 2 sometime and sometime it shows 1. All ads are not showing perfectly. Note: link ads are showing..
What is the reason of this. I belong to india. According to me it is happening due to the deduction in the indian advertisers. But, in another health website ads are showing. Hence, this prediction proved wrong with me. Could you suggest me the reason beHind this problem. Thanks for your question. AdSense lifted the 3-ads-per-page limit, but might still not fill ads that are too close together. Other than that, I don‘t have an obvious idea. This is an awesome feature, I tried it on my blog and it was great, it converts better in my opinion. Hey, what word distance should I make to show ads finely , I.e. after 300 words or more ?? Sorry, I don’t understand what you are referring to with “word distance”. There is no explicit minimum amount of words, but 300 is not a bad start. I tried the same. But the ads do not show up. I do not understand where I’m doing wrong. The theme I use is twenty seventeen. Hi kerim, if you can find the Auto ads code in your site’s source code then everything is fine there. New AdSense accounts might need some time. You can also use their troubleshooter to see if something in your AdSense account is not set up properly (yet). This means the issue is with AdSense. Looking at your URL, I would guess that it has too little content to be approved. I have added your plug in auto add but so far no ad displayed in my site. Hi there, it can take up to 48 hours until ads appear. If not, your site was not fully verified by AdSense or does not comply with their policies. Autor ads have never ever try to show in my header and it also display my matched contents at the bottom of my page which I don’t want. please is there any way to control it to make it show where I want it to show? Hi there, no, there is no way to manage where AdSense Auto ads show up, yet. The “yet” means that this will be possible in the future. I actually tried auto ads but I was forced to remove it after several day . One things is that with new posts, the ads was just too more CH but it was limited with old posts. I personally do not feel comfortable with too much ads in between contents. I noticed there is high bounce rate when I am doing that. It might be OK for job or new site but for a professional blog like mine, its not perfect. Hi , Thomas. Autoads at first I never heard of it until I found your post. This is useful info. Keep it up.Have bookmark your webpage. Please tell me how can we see earnings from auto ads in reports? Hi Sherry, just go to the Performance reports and choose “Ad Placements” as the report type. It will list Auto ads as well.